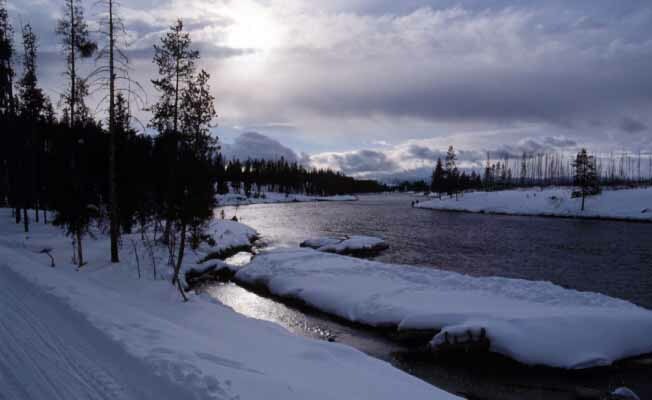 Yellowstone Alpen Guides provides naturalist led tours in Yellowstone National Park and the surrounding areas both in winter and summer. Offerings include regular daily service and customized multi-day packages to meet your specific needs. Yellowstone is open for the winter season from December 15th through March 15th. During this winter season, Alpen Guides offers full day snowcoach tours to Old Faithful and the Grand Canyon of the Yellowstone. Travel in comfort aboard warm, ten-passenger traditional snowcoaches while viewing the abundant wildlife and scenic splendor found only in Winter Yellowstone. Cross country ski or snowshoe trips are also available on the snowcoach tours or by themselves on the adjoining Gallatin National Forest. We have good rental equipment for your convenience and enjoyment. Our daily summer tours are specifically customized to your needs and desires. Our great naturalist-guides will maximize your time in Yellowstone making your visit more meaningful and fun. Whether you want a full day hike, an early morning wildlife viewing tour, a day spent chasing geysers, a scenic visit to Yellowstone's major attractions, a combination of these or something else, Yellowstone Alpen Guides has the knowledge and personnel to assure you the best Yellowstone National Park has to offer. Call us at 1-800-858-3502 or visit us on the web at http://www.yellowstoneguides.com for more information.